With great backup from my colleagues Anna De Liddo and Michelle Bachler, I spent last Thurs/Fri at the first UK Visual Analytics Summer School (VASS 2010), hosted at Middlesex University. Huge thanks to Simon Attfield for pulling together this week-long event. (3 Jan 2011: all the lecture videos are now replayable). The key message I took away was that the work that we are focusing on — visual analytics for scaffolding interpretations/debate about what a given element means — was recognised as distinctive and filling a potentially valuable niche, and we need to take the conversations further to connect this layer of meaning-making (in which the sensemaking is largely dependent on human insight making connections), with the many other powerful visual analytics tools that help automatically detect patterns in datasets and documents. The “craft skill” of using computational tools for thinking/modelling is a long-term interest of mine. Tools for higher level thinking can rarely be “thrown over the wall” and put to immediate use by newcomers. As my colleague Al Selvin emphasises in his research on Knowledge Art, these are better thought of as musical instruments: they can enable virtuoso performances, but don’t expect this on Day 1. So, I found agreement that the third dimension in our framework requires more attention: understanding the nature of fluency with these tools, which includes the habits of mind and skillset required to use them well. Who are we designing these tools for, and how much does a given person need to know in order to gain value, and how soon? De Liddo, Anna and Buckingham Shum, Simon (2010). Capturing and representing deliberation in participatory planning practices. 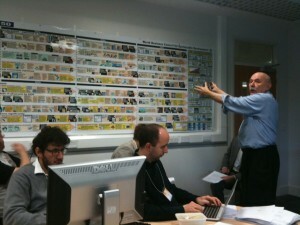 In: Fourth International Conference on Online Deliberation (OD2010), 30 Jun – 2 Jul 2010, Leeds, UK. De Liddo, Anna and Buckingham Shum, Simon (2010). Cohere: A prototype for contested collective intelligence. In: ACM Computer Supported Cooperative Work (CSCW 2010) – Workshop: Collective Intelligence In Organizations – Toward a Research Agenda, February 6-10, 2010, Savannah, Georgia, USA. Selvin, A.; Buckingham Shum, S. and Aakhus, M. (2010). The practice level in participatory design rationale: studying practitioner moves and choices. Human Technology: An Interdisciplinary Journal of Humans in ICT Environments, (Special Issue on Creativity and Rationale, Ed. John Carroll), 6, (1), pp.71–105.